Veterinary Microbiology, Third Edition is a comprehensive reference on the bacterial, fungal, and viral pathogenic agents that cause animal disease. Now in full color with improved images throughout, the new edition has been thoroughly updated to reflect information from current research and diagnostic and clinical publications. Key changes include a review of microbial cell structure and function and increased emphasis on the key points of pathogenesis and host responses to infection. Organized into four sections, the Third Edition begins with an updated and expanded introductory section on infectious disease pathogenesis, diagnosis and clinical management. The second section covers bacterial and fungal pathogens, and the third section describes viral diseases and viruses. The final section presents a systematic approach of describing infection and disease of animals. 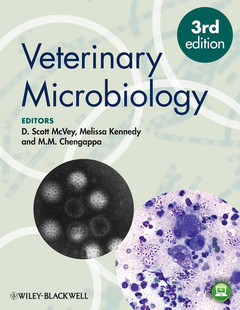 Equally useful for beginning veterinary students and seasoned practitioners, Veterinary Microbiology offers a thorough introduction and reference text for veterinary infectious disease.